1. All influent and effluent flow rates in the liquid, solid and gas state must be determined. 2. The concentration of all important components must be measured in these different streams: the influent raw materials A and B and the effluent components C and D (Eq. 13.1), the catalysts and auxiliaries (Eq. 13.2), the byproduct E (Eq. 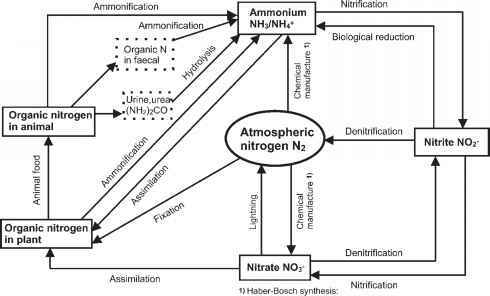 13.3) and all important impurities N1, N2 and N'. 3. Do these components change their state by crystallization, condensation or evaporation? 4. Write mass balances for all components and test them by using measurements. Fig. 13.3 General schematic of a production process. • We assume there is no change of state. Figure 13.3 presents a simple scheme describing this situation. The following considerations follow explanations by Christ (1999), who used masses mi = ci Vi.